Joseph Reed Ingersoll (June 14, 1786 – February 20, 1868) was an American lawyer and statesman from Philadelphia, Pennsylvania. In 1835 he followed his father, Jared Ingersoll, and his older brother, Charles Jared Ingersoll, to represent Pennsylvania in the U.S. House. He graduated from Princeton College in 1804. He studied law with his father, was admitted to the bar and commenced practice in Philadelphia. He was elected in 1834 as a Whig anti-Jacksonian candidate to the Twenty-fourth Congress. He declined to be a candidate for renomination in 1836, serving 1835–1837. He resumed the practice of law. Ingersoll was elected as a Whig to the Twenty-seventh Congress to fill the vacancy caused by the resignation of John Sergeant. He was reelected as a Whig to the Twenty-eighth, Twenty-ninth, and Thirtieth Congresses. He declined to accept the nomination as a candidate for reelection in 1848. In all, his second stay in office lasted from 1841 to 1849. He was the chairman of the United States House Committee on the Judiciary during the Thirtieth Congress. He was an advocate for protection and a firm supporter of Henry Clay. One of his noted efforts in the House was a defense of Clay's tariff of 1842. In 1852, President Millard Fillmore sent him to the United Kingdom as the U.S. Minister. He served about a year, and then retired to private life, devoting himself to literary pursuits. The degree of LL.D. was conferred on him by Lafayette and Bowdoin in 1836, and that of D.C.L. by Oxford in 1845. He died in Philadelphia in 1868. Interment in St. Peter's Protestant Episcopal Churchyard. He was a warm adherent of the Union, and at the time of the American Civil War prepared an essay entitled "Secession, a Folly and a Crime." He published a translation from the Latin of Roceus's (Francesco Rocco's) tracts "De Navibus et Naulo" and "De Assecuratione" (Philadelphia, 1809), and was the author of a Memoir of Samuel Breck (1863). United States Congress. "Joseph Reed Ingersoll (id: I000019)". Biographical Directory of the United States Congress. This article incorporates text from a publication now in the public domain: Wilson, J. G.; Fiske, J., eds. (1892). "Ingersoll, Jared" . Appletons' Cyclopædia of American Biography. New York: D. Appleton. 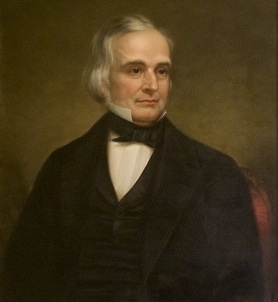 George Wolf was the seventh Governor of Pennsylvania from 1829 to 1835. On June 29, 1888, he was recognized as the "father of the public-school system" in Pennsylvania by the erection of a memorial gateway at Easton. Jared Ingersoll was an American lawyer and statesman from Philadelphia, Pennsylvania. He was a delegate to the Continental Congress and a signer of the United States Constitution. He served as DeWitt Clinton's running mate in the 1812 election, but Clinton and Ingersoll were defeated by James Madison and Elbridge Gerry. Charles Jared Ingersoll was an American lawyer, writer and politician who served as a Democratic member of the U.S. House of Representatives for Pennsylvania's 1st congressional district from 1813 to 1815, Pennsylvania's 3rd congressional district from 1841 to 1843 and Pennsylvania's 4th congressional district from 1843 to 1849. He served as a member of the Pennsylvania House of Representatives in 1830. William Sprague, also known as William III or William Sprague III, was a politician and industrialist from the U.S. state of Rhode Island, serving as the 14th Governor, a U.S. Representative and a U.S. Senator. He was the uncle of William Sprague IV, also a Governor and Senator from Rhode Island. Martin Russell Thayer was a Republican member of the U.S. House of Representatives from the U.S. state of Pennsylvania. Charles Naylor was an American lawyer and politician from Pennsylvania who served as a Whig party member of the United States House of Representatives for Pennsylvania's 3rd congressional district from 1837 to 1841. Dudley Marvin was a U.S. Representative from New York. Samuel Galloway was a U.S. Representative from Ohio. Bellamy Storer was a U.S. Representative from Ohio, father of Bellamy Storer (1847).